We're going to get lead levels in school drinking water as low as possible. That's the promise from Nashville Mayor Megan Barry. It follows an exclusive NewsChannel 5 investigation. It was Barry who worked with Metro Schools this summer to come up with the money to test every water fountain in every school in the city. But NewsChannel 5 discovered that those tests show some students are still drinking lead-contaminated water -- which means the mayor's job may not be done. "You guys have been doing these stories. I think you guys have had a lot of really great reporting on it," Barry told NewsChannel 5 Investigates. We caught up with the mayor at the grand opening for a health care company's new operations center in Antioch -- just a few miles from Haywood Elementary School where, tests show, students are still drinking water with high amounts of lead. 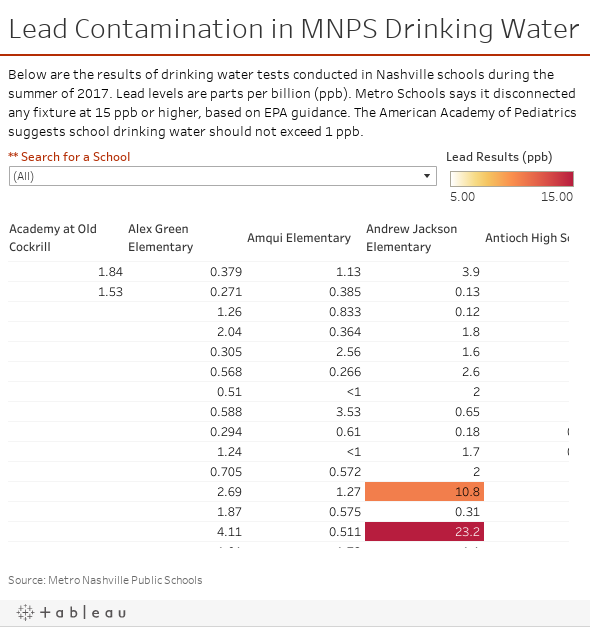 Lead is a neurotoxin that, in young children, can cause learning and behavioral problems. "That's why we've been working with the school system to help make sure that we are doing more flushing and that we are absolutely focused on getting that drinking water as clean as possible," Barry said. The school system has been working off an EPA recommendation of 15 parts per billion of lead. But doctors say no amount of lead is safe for children. Replacing older water fountains and other fixtures that contain lead. Potentially even digging up service lines that connect the schools to the public water lines. "Whatever they need to make sure that this will be safe drinking water is what we'll do," the mayor insisted. NewsChannel 5 Investigates asked, "Do you have any idea how much money we're talking about?" "I haven't been given a number," she answered. "So clearly as we move forward we'll want to know what that number is. "But we want our kids to make sure that they have safe drinking water." Meanwhile, the Metro Public Health Department told NewsChannel 5 that it has now signed off on a Metro Schools plan to flush the pipes inside the schools on a regular basis to lessen the chance of the toxic metal building up in the water that children drink. Still, it's not clear when or how that method will be implemented.